This was our last day in Funchal before returning to Porto on the mainland July 6th. We decided to take a tour since we had toured the southern and western portions of the island but had not yet seen much of the eastern end. We booked a full day tour in a Land Rover four-wheel drive vehicle and were picked up at our hotel at 9:15am. Our first stop was at the highest peak on the island that you can drive to located at an elevation of nearly 6,000 feet high. There is a slightly higher peak nearby although you can only reach that peak by foot. The views of the surrounding area were wonderful from this lookout and the air was fresh and crystal clear. Our next stop was at Ribeiro Frio where we took a 45-minute walk through the woods to see the levadas. 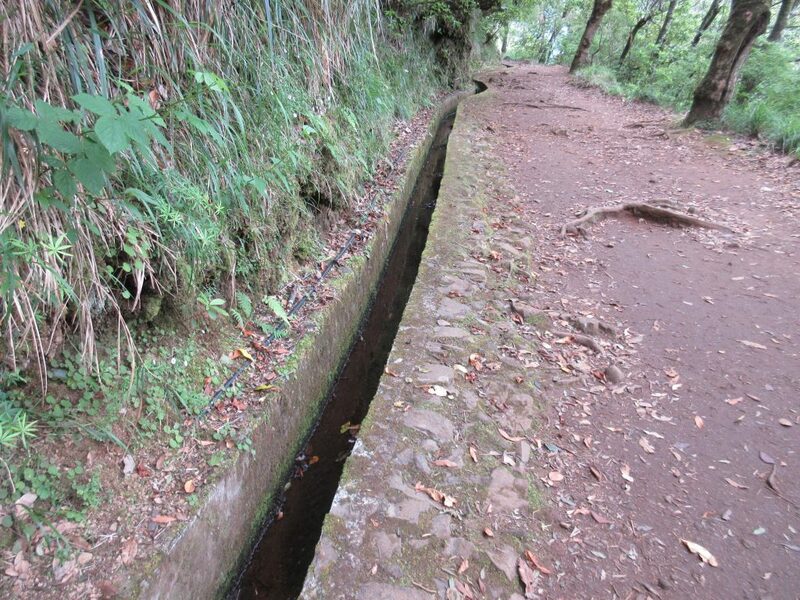 The levadas are the irrigation channels used to carry the water from the mountain springs around the entire island. These concrete channels are connected by pipes in some places and the government maintains the system. The farmers pay a fee to access the water for their fields and can request the number of hours per day that they want to have the water flowing to their land. The government then regulates the flow of the water so that each farmer has the needed water to maintain their crops. Next, we took some very bumpy, narrow and often dirt and rock roads across a mountain to see how the farmers access their lands. Often farmers live in one spot but may have land in multiple other locations they maintain. 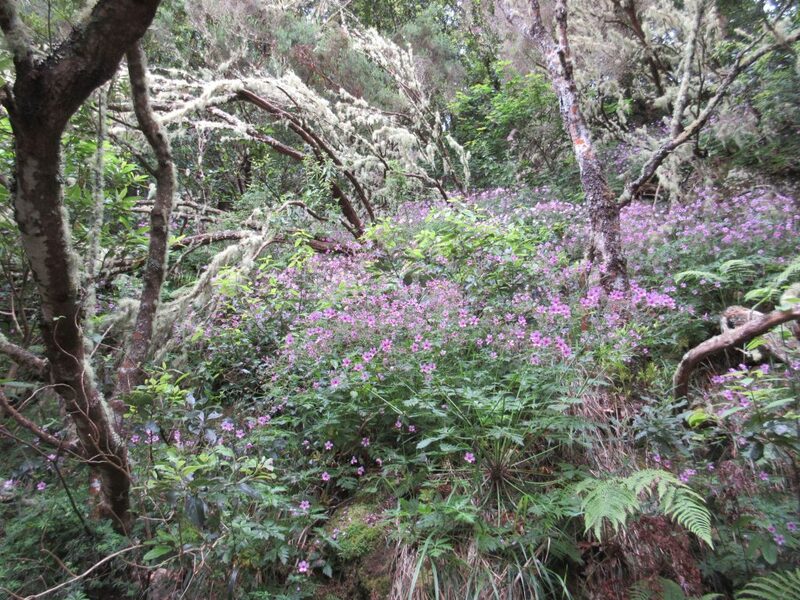 Many of the steep terraces of land are not accessible by vehicle or machinery and must be maintained by hand. Crops must also be picked and transported by hand. Along the way we were transported through very dense forests where almost no daylight can be seen at the ground because the trees are so close together and the canopies block out all of the light. The town of Santana on the north coast directly north of Funchal was our next stop. This community was once known for its unique thatched roofed houses although today almost all of these homes are gone. The cost to maintain these homes has become too expensive. 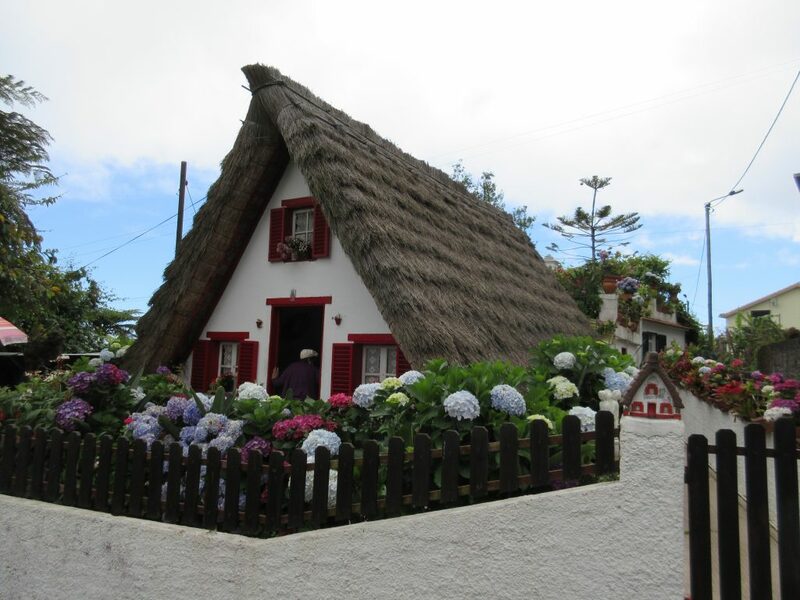 The thatched roofs only last about five years and a new roof can cost about 6,000 euros. We were able to visit one of these thatched roof homes that has been in the same family for six generations. They do not live in the home anymore but maintain it as a type of museum for tourists to visit. The older lady who owns the home welcomed us with a tin of cookies and a shot of coffee liquor. These homes typically only had two small rooms on the lower lever and a loft like space above, where the children slept, that can only be accessed by a latter from outside. The kitchen and bathroom would have been outside of the house. This home is over 200-years-old and had a bath and small kitchen added to the rear of the home. For lunch we stopped at a local hotel overlooking the north shore where we had a very nice three-course lunch. The first course was a pureed vegetable soup served with bread and butter. Next, we had the local white fish served with sweet potatoes and mixed vegetables. For dessert they served us a passion fruit mousse with a passion fruit sauce and coffee. After lunch we headed further east to visit a sugar cane factory where they process sugar cane into juice and then into rum or molasses. 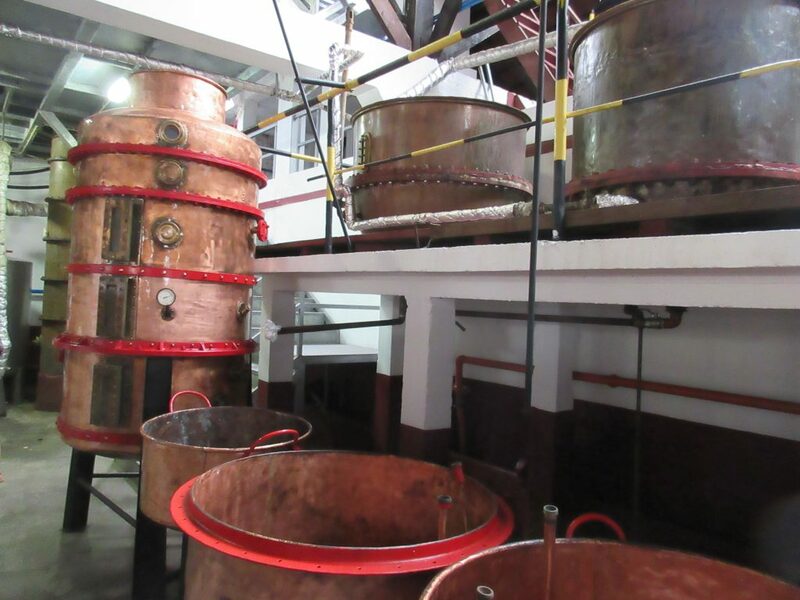 The rum is made for local consumption with 50% alcohol and for export with 40% alcohol. They also sell molasses cookies which we had a sample of along with the rum. 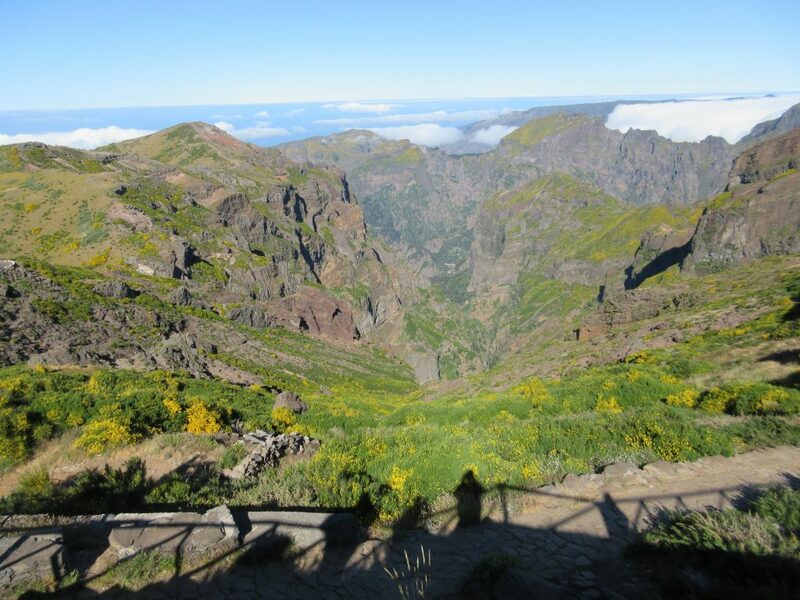 Next, we stopped at the furthest eastern point where we had been to San Lourenco to hike the previous Saturday. This was our last stop of the day before heading back to our hotel in Funchal about 5:00pm. It was a busy but enjoyable day and we now feel like we have seen most of what the island has to offer. For our last night in Funchal we headed back to Riso where we had our first dinner for the pork cheeks which were exceptional once again.